Just about every blogger who’s baked anything probably has a story about how she or he discovered Dorie and was inspired by her wonderfully written, aspirationally beautiful yet warmly accessible cookbooks. Molly Wizenberg mentioned that one of the reasons she began food blogging was in hopes of becoming Dorie’s assistant; I too harbored dreams of one day meeting this woman beaming from the back of the book, who was BFFs with Pierre Hermé and made puff pastry look so easy. Of course, what makes Dorie a true fairy godmother is that I actually met her! The day she left a comment on my post about her World Peace Cookies remains one of the happiest moments of my blogging life, a moment that made me realize that if I hadn’t followed through on my motivation to start a blog on baking, something as magical as this would never have happened. Then, when I visited New York and e-mailed Dorie, wondering if I might have a chance to say hello to her, she replied yes! A dream come true, for sure, to find one of your idols as lovely and wonderful as you’d hoped! Dorie, of course, has made the dream come true for many other bloggers as well: I don’t know of any other author that’s inspired two online cooking clubs, and who not only welcomes her fans with a smile, but also recognizes them with joy and gives them a big hug. You can’t manufacture this kind of genuine goodness and charisma, and I think that’s the key to Dorie’s success. Dorie is also a shining example of how to navigate the ever-blurring lines between the internet and traditional print media: one of the reasons I admire Dorie is how she’s effectively she’s utilized her site to connect with her fanbase. She actively engages with her readers, creates a sense of community, and encourages them to become better bakers. Certainly these are all actions that bloggers are told they “must do” these days to “build their brand”, but Dorie does it so sincerely and organically – and I know readers are smart enough to recognize the difference. Small surprise, then that Dorie’s latest book on French cooking was one of the most anticipated titles of the year, and that a club has sprung up devoted to cooking through the book. I really feel like Around My French Table: More Than 300 Recipes from My Home to Yours could become the modern day Mastering the Art of French Cooking – it’s French cooking, rendered simply but not simplistic, with results that make you realize there’s no reason why anyone should be afraid of trying their hand at stuffing a Cornish hen, or making osso buco. The directions are clear and precise, the photos inviting, and I could just sit there and read the headnotes all the way through the book, hearing Dorie’s intimitable voice in my head. I’d also like to add that the husband has become quite the aspiring chef in the kitchen (yes, I’m a lucky girl), and as he expressed an interest in taking on French cuisine, he was really, really excited to see this cookbook arrive at our home. So, I’m going to be presumptuous and say that I feel like this book is almost like Dorie’s wedding gift to us – many happy weekends of delicious meals are most certainly assured. Merci millefois, Dorie! 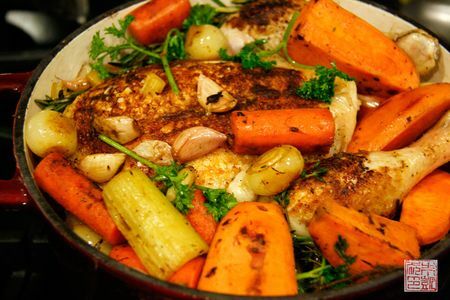 The Chicken in a Pot pictured on the cover – when the husband saw it, he declared that was what we would be eating that weekend. 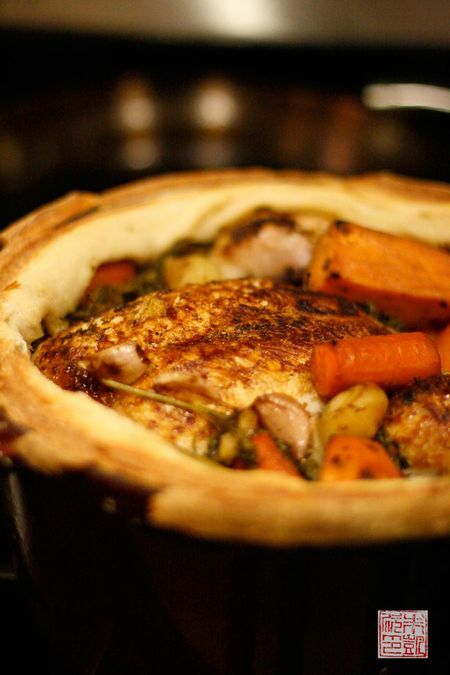 It would be a nice way to break in our brand new Dutch oven, by wrapping a crust of dough all around its edges. Although it takes a while to make, the results are surely worth it. Photographed above are the chicken and vegetables in the pot before baking. I love the colors of the vegetables. Since I was the baker of the house it was my task to make the dough of flour and water and seal the pot – a pretty easy task, although if you want it to look as pretty as the photo in the book do take some care to shape the dough nicely and stretch it evenly around the rim. Out of the oven: the seal breaks easily with a knife and releases a fabulous scent of garlic and herbs. It’s also a really photogenic dish, if you can’t tell! This unique twist on a roast chicken dinner gets a resounding yes from me and the husband! Dessert was Marie-Hélène’s Apple Cake, one of those homey yet ridiculously delicious creations: apple pieces barely held together by a batter of eggs, sugar, flour, and butter. With a scoop of vanilla bean ice cream, there’s nothing more satisfying in front of a fire while the evening darkens into night outside. I especially like that the recipe calls for using as many different types of apples as possible – it definitely gives it a rustic, use-what-you-got-from-the-garden edge. 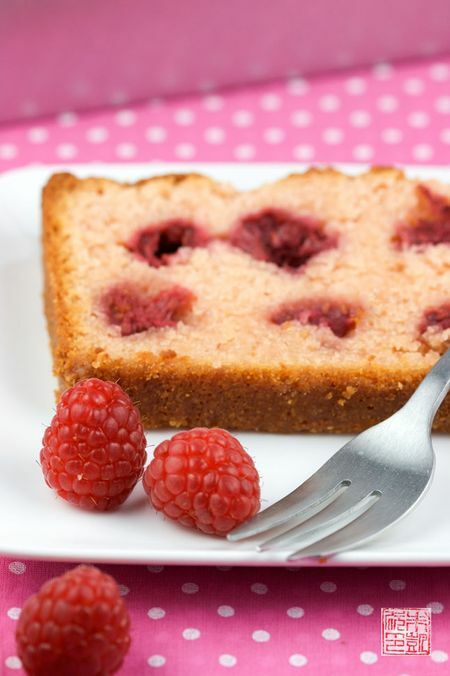 Finally, one recipe I had to try when I spotted it: the Ispahan Cake. I think it’s almost a Pavlovian response now among bakers to think of Pierre Hermé and his famous macaron when raspberries, roses, and lychees are mentioned together. 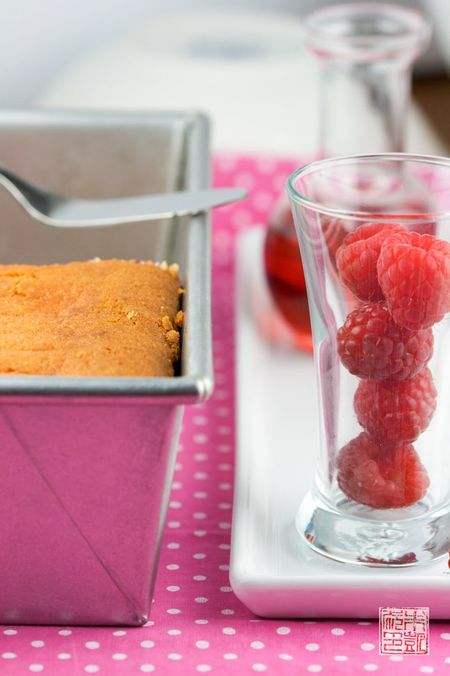 Dorie gives us a down-to-earth iteration of the Ispahan in her pretty in pink loaf cake, laced with rose syrup and studded with raspberries like hidden jewels. The rose syrup and extract make all the difference; rose syrup is fairly easy to find in Middle Eastern groceries and Dorie recommends the Star Kay White brand of rose extract. 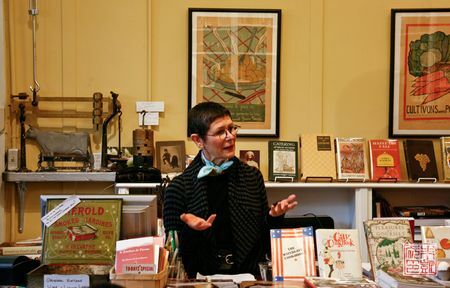 At her book signing event at Omnivore Books, Dorie talked about her lifelong love for France and how this book documented this love affair – in essence, it almost acts as her autobiography. There’s no doubt about Dorie’s deep love for la belle France in this book, and I’m thrilled that she’s chosen to share it with all of us. Thanks for writing such a great book Dorie, for coming to San Francisco twice in one week so I could hug you twice, for enjoying the jam, and for being you! In a medium bowl, beat the eggs with a whisk until they’re foamy. Pour in the sugar and whisk for a minute or so to blend. Whisk in the rum and vanilla. Whisk in half the flour and when it is incorporated, add half the melted butter, followed by the rest of the flour and the remaining butter, mixing gently after each addition so that you have a smooth, rather thick batter. Switch to a rubber spatula and fold in the apples, turning the fruit so that it’s coated with batter. Scrape the mix into the pan and poke it around a little with the spatula so that it’s evenish. I suddenly felt so hungry because of the delicious recipe I found on your blog post. Really yummy! Nom nom nom! I’d just heard about Dorie Greenspan recently! Sounded wonderful. She was interviewed on NPR and spoke of a Southern French dish of stuffed cinderella pumpkin…. I’ll have to try! So exciting to see you feature her here too! Yes she is certainly inspirational. I live in little old New Zealand and she is definatley making an impression here. There are seeveral NZ bloggers (myself now included) who belong to one or both of her blogging groups. I missed out on the TWD group as I was too late to the blogging world even though I used to avidly follow (and bake) the recipes on other bloggers sites. Her recipes transcend the differences in our countries and now I think I’m just an enamoured as all you other Dorie fans out there. Her books are amongst my absolute favoutites! wow, what a beautiful cake! and the chicken is very photogenic. im not familiar with dorie, but i will have to find this book if there are recipes like this inside. thanks! I really don’t know how to respond to this overwhelmingly generous post. If you think of me as your fairy godmother, nothing could make me happier. Oh! I love Dorie and I love her books. She’s such a wonderful girl! Oh, I love Dorie and all her books. She’s such a wonderful girl. 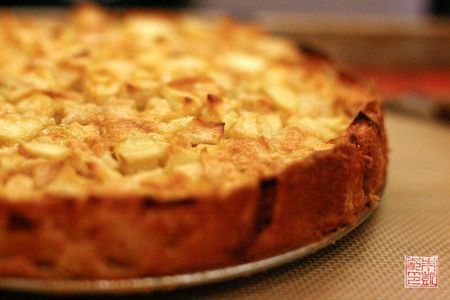 The apple cake is on my to-bake list! love cake..any kind of cake…so the healthier it can be for me, the better! I need to start baking more with the whole wheat flour. These are wonderful ideas for Thanksgiving, thanks for sharing!